The long cold winter swept over Jones County. It had been days since I had ventured past the threshold and I was nearly out of pot stickers. The Meeks residence was at Defcon 2. I was getting stir crazy. Action needed to be taken, so I bundled up, put on a sweatshirt and a coat, followed naturally by one additional coat, and topped off with a pair of gloves and a smart chapeau. The world outside waited and I was certain that there may would be an impulse tool purchase in my very near future. It just so happens that the Acme tools, which I was sure, would have a tool I might fancy, was on the way to the Wal-Mart. And by on the way I mean that I only needed to drive past Wal-mart by 5 or 6 miles, turn right, and head an additional 4 miles. Sure enough there was a tool I just couldn’t live without. A mini dozuki cross cut saw was waiting for me. It had plenty of Japanese characters on the box, and as you know by now, I am powerless against such brilliant packaging. In fact, it didn’t have any English on it at all. I assume they do this to keep their exceptional saws a secret, and thus, assure themselves an advantage in the quadrennial hand saw Olympics, which is held in Helsinki this year. Helsinki is most well known for the brilliant Gold medal marathon joint match of 1956, where John Henry Smyth of England was narrowly defeated, by Arashi ‘The Storm’ Yamamoto, when Smyth suffered hand cramps in the final set and mistakenly cut the lesser known pigeon tail joint, giving the point to Yamamoto. Smyth never recovered and spent the remaining years of his life joining drawer sides with biscuits and gravy. Needless to say his choice to substitute turkey based gravy for wood glue, was at best, a poor one, and few post Helsinki pieces survive today. Thinking of poor John Henry as I drove home, with pot stickers and new saw safely beside me on the passenger seat, I vowed never to suffer his shame. It has been written that using Japanese hand saws takes a bit of practice, as most woodworkers are use to the Western saws, which cut on the push. I have not used a Western hand saw in the last 25 years or so, and as such, figured that this rule didn’t apply to me. I would take my new saw out of its packaging; touch it to wood and with the grace and power of ‘The Storm’, cut perfectly flat and straight. My assumption was that with one, or possibly two tries, I should be sufficiently trained, to make the saw do my bidding. Strangely, this was not the case. 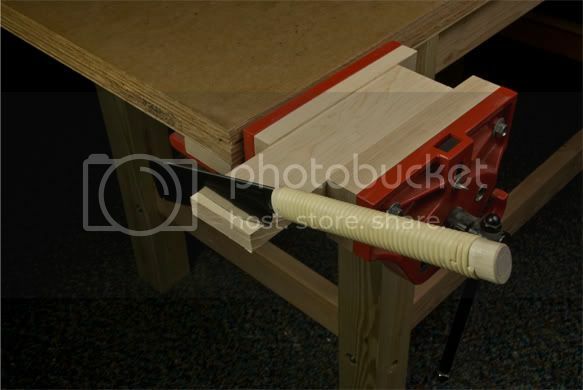 I clamped a bit of hard maple into the vice, and went at it. The first cut was hideous. Neither straight nor flat, I held the tiny piece of wood in my hand and studied it. I had started out straight and then veered towards my body. Easy enough to fix, I would just cut more slowly and pay attention. I took the added step of drawing a line on my practice wood this time. Surely my second try would be perfect. I followed the line, taking my time, and making sure to take nice easy pulls on my new saw. When I was nearly done, and the piece about to fall off, I had a sense of triumph, knowing that this time I had done it. The triumph was short lived. While I did stay on the line, which was an improvement, I did not cut straight through the wood. I estimate that the 90 degree angle was closer to 86 degrees. I tried again. Again I veered away from my body. The fourth attempt was very close to 90 degrees. One more attempt and I would be an Olympic caliber hand saw user. Sadly the 5th attempt could be described as an embarrassment to me, my family, and even my ancestors. Could I hear John Henry snickering? After an hour or so, I did feel I was making marked improvement. This skill will, like all the others, take a bit of practice. I do like my new saw though. I like it a bunch. The cuts are smooth, the kerf is thin, and on the rare occasion when I do cut true, the results are quite satisfying. I would recommend the saw to anyone who asks. Of course, since I can’t read the packaging, I have no idea who made my little saw. I would say it is a cut above my other Japanese hand saw from the Home Depot. Pun Intended. Now for some pot stickers…yummy. practice , practice , practice ! waiting for us to do something new ! FWIW, I notice that you have the wood chucked at what is probably waist height (bench top). At that height, I’ve always found it easier to get a good crosscut starting from the near side. 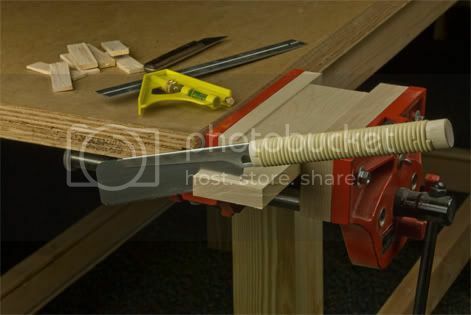 Crosscutting from the far side works well for me when the piece is anchored well below waist level (as on a low Japanese cutting bench). Truly a master would know that you didn’t squat like a samurai warrier before beginning. The purpose would be to drain your mind of all hunger pangs for the pot stickers and caused you to cat a path to the nearest microwave.